A couple of weeks ago, we took our kids, plus Addie, to Nivens Apple Farm to pick apples, look at pumpkins, and enjoy a beautiful afternoon playing outside. I think they all thoroughly enjoyed themselves. I even managed to get all 4 kids to pose for a few pictures. While I can't say that I quite understand the thrill of hunting, I have a husband who is absolutely in love with the sport and two little boys who are quickly following in their daddy's footsteps. 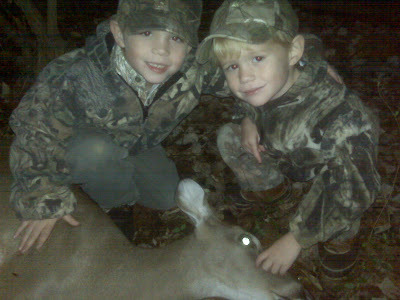 Tonight they got to go sit in a stand with their daddy and watch him kill a deer for the first time. I must say there were three extremely happy boys in our house tonight. Here is the proud picture from D.J. 's phone. lost his very first tooth! On another note, I have failed to blog about several important occasions in the Horton household. I hope to catch up on 3 months worth of birthdays, trips, and events soon! How many have seen this side of Micah? We know "this" Micah very well, but I have a feeling many of you do not! He does continually make us shake our heads and laugh! Early in June, I took the kids, and we headed to Alabama to Lake Martin to meet my parents, sister, and niece. We had been unable to see Lacy and Audrey since Christmas and were very excited about getting to spend some much needed time with them. We all had a great time swimming, riding the boat and waverunner, tubing, fishing, and playing outside. D.J. (and Mr. Bill) even surprised us at the end of the week. He couldn't stand the thought of all the fun we were having without him! Somebody sure was happy to see her Aunt Lacy! We finally found somewhere to confine this little rascal where she was happy! We had a wondeful time with our family! In fact, we had so much fun, we're going back next week for a short July 4th trip! We had a relaxing Father's Day at home after returning from a mission trip in West Virginia (more on that soon). Lily, enjoying a few seconds of cuddling, with her very favorite person! Enough resting at home, time for some R&R on the golf course with daddy. What a wonderful daddy God had blessed us with! I'm a 29 year old pastor's wife and stay-at-home mom to three children; Ty (5), Micah (31/2), and Lilian (9 months). The Lord has blessed our family tremendously and we look forward to sharing with you all he is doing in our lives. Test test test... Mic Check? A Window Into Our World . . .
Jeff and Les Plus One!